Mousetrapper advance 2.0 is our top seller and comes in two designs with elegant accent colors in either white or turquoise. Advance 2.0 relieves and prevents mouse and other problems that may occur when working with a traditional computer mouse. The centered Mousetrapper location in front of the keyboard provides a good ergonomic working position with arms close to the body and hands near the keyboard. With this you can prevent both and often relieve the stress damage that may occur when you work outside your own axis as you do with a normal computer mouse. You do not need to stretch yourself for the mouse on the desktop anymore. The wide and soft wrist support also provides support and relief for the neck, shoulders, arms and wrists. Mousetrapper advance 2.0 is our top seller and comes in two designs with elegant accent colors in either white or turquoise. With 6 programmable buttons, you have a great opportunity to get your Mousetrapper just the way you want it. The pointer speed has increased and there is a completely new scroll function with buttons for up and down scrolling. The downloadable software, MT Keys, is also updated with significantly more opportunities for advance 2.0. There is also a brand new version of MT Keys for Windows 10 that can be downloaded from the Microsoft Store. The hand restraints are interchangeable, making the product easy to keep fresh. On Mousetrapper advance 2.0, you also have an evolving keyboard pad that fits the new super thin keyboard as well as the higher standard keyboard. 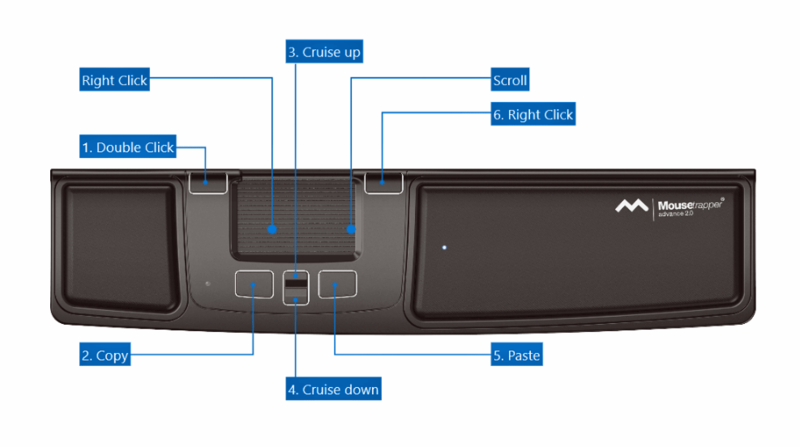 By placing your index, middle and ring fingers on the control pad you can control the cursor with simple movements as the control pad moves smoothly in two dimensions. You can also left-click anywhere on the control pad. MT Keys software lets you easily reconfigure the existing functions of your Mousetrapper to choose exactly the functions you want. MT Keys software is easy to download from the Mousetrapper website. Relief for neck, shoulders, arms and wrist.